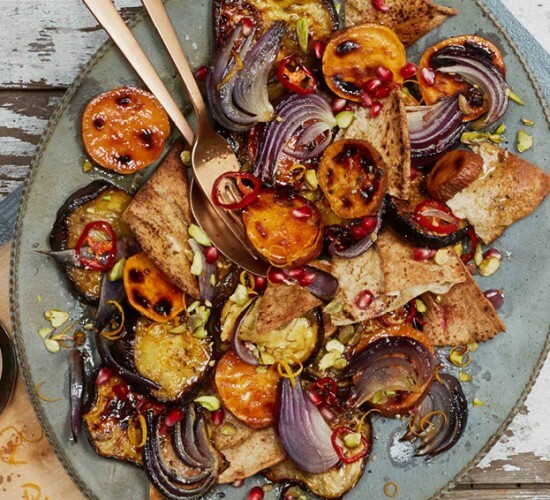 These sticky, sweet honey-roasted aubergines and sweet potatoes make a filling vegetarian main course when served with a cooling dollop of live yoghurt and crunchy pitta chips. Preheat the oven to 190°C/375°F/gas mark 5. Line two roasting trays with parchment, and spread the sweet potatoes and aubergine out across both trays. In a bowl, mix together the honey and olive oil, with the juice of half an orange. Drizzle the mixture over the aubergines and sweet potatoes so they’re well covered. Massage in the cinnamon, cumin, coriander, pepper and salt. Add in the cloves of garlic before popping the tray into the oven for around 35 minutes. After it’s been in the oven for 14 minutes, add the onions and red chilli (if using). Mix the aubergine and sweet potatoes around if needed. place back in the oven. To make the crispy pitta, brush both sides of the pittas with oil, then cut into triangle shapes with scissors or a sharp knife (it is up to you whether to make them the same size). Place them on another baking tray. Sprinkle with a little salt and pepper before popping in the oven for approx. ten minutes, until golden. Set to one side for serving. Check the aubergine and sweet potato are cooked and caramelised, before taking them out of the oven. Squeeze the roasted garlic into a bowl with the yoghurt and juice of the remaining half orange. Mix well and season to taste. Zest the skin of the orange half on top, drizzle with olive oil and sprinkle with a little cinnamon. To serve, arrange the aubergine and sweet potato on the platter with the red onion and chillies. Add the crispy pitta pieces to the salad. Finish with a drizzle of olive oil and honey (or molasses). Zest over the other half of the orange, and sprinkle over the pistachios and pomegranate seeds to garnish Serve with the yoghurt dressing on the side.